The new Pet Travel Scheme (pet passport) means that exhibitors in the United Kingdom can now travel with their dogs and compete in many parts of the world, as long as they have a pet passport that complies with the requirements of the Department of Environment, Food and Rural Affairs (DEFRA). To be able to share your love of your breed not only with fellow countrymen but world-wide as well is the ultimate experience for a keen exhibitor. Each dog must have its own passport that shows he is up to date with vaccines and other health information needed to travel from and re-enter the UK. For information on the pet passport contact DEFRA 0870 241 1710. Not every airport and ferry company allows dogs to pass through. DEFRA can give an up to date list to travellers but check before you leave that the details have not been changed. Entries to overseas shows are made very much in the same way that they are made in the UK however these shows are governed not by the Kennel Club but by the FCI. The Federation Cynologique International (FCI) is a worldwide organisation that represents pure-bred dogs. Unlike our Kennel club you do not have to register your dog with this organisation. This organisation holds the diary of international dog shows and is the ideal place to start when planning your assault on the international show scene. They can be contacted at: 13 Place Albert l, B6530, Thuin, Belgium. 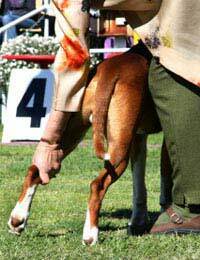 Many UK breed clubs reciprocate with overseas breed clubs and have details of up and coming breed shows overseas. If your club doesn’t list these shows why not suggest that they make this facility available? Dog World and Our Dogs often list details of forthcoming international shows, they also have details of companies organising coach trips to these shows – ideal if you don’t fancy the long drive! It is advisable to check that both your dog’s and your own health insurance cover injury and illness whilst outside of the UK. If you are driving overseas also ensure your driving licence and car insurance is in order. If you were to break down does your recovery company cover you whilst abroad? There are also different regulations concerning dogs in cars, depending upon the country. Enquire with the AA or the RAC for information on your chosen destination. If in doubt don’t leave your dog alone in a car! ‘Info Expos’ magazine publishes full details of international dog shows. Obtain a copy from: Jean Wastiaux, 24/2 Rue v Rousseau, B7181, Feluy, Belgium. This magazine issues eight copies each year and has all the information an exhibitor needs for shows in over 40 countries. Be aware that class entries vary from country to country. There are differing ways to make up a champion depending upon whether it is a national award or an international award won by the dog. The UK Kennel Club can advise on competing abroad. Speak to fellow exhibitors who have travelled overseas to exhibit their dogs. You may be able to accompany them; it would make things easier for your first trip. There may seem to be a lot of information to follow before you can show your dog overseas, but once you have studied the information above and spoken to fellow exhibitors it will become easier and enjoyable.